whether that be a family member, friend or loved one. Honor someone very special in your life who has made the ultimate sacrifice and has risked, or is still risking, his or her well-being to protect you and this great country in the name of freedom. Chart contains detailed personalization instructions. Fabric: Stitched on 32 count Lambswool Jobelan from Wichelt Imports, Inc. Majority stitched 2 over 2. 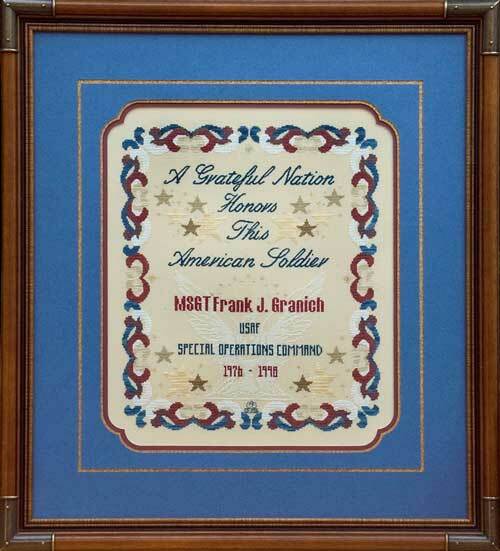 Words “A Grateful Nation Honors This American Soldier” stitched in petite stitch (1 over 1). Materials Summary: A total of 18 Weeks Dye Works colors used in model. This is a variegated floss and there are no comparable substitutes.